The Osaka Bar Association is an organization of practicing attorneys with law offices and legal professional corporations located in Osaka Prefecture. Any person who wishes to practice law as an attorney must join the Osaka Bar Association. In other words, the Osaka Bar Association is not simply a voluntary professional association for attorneys, rather, membership is compulsory. Attorneys are granted a high degree of autonomy which is rather unique among other legal systems of the world (Autonomy of Attorneys). The affairs of the Osaka Bar Association are carried out based upon membership fees and the efforts of members, with decisions being made in an autonomous fashion. The Osaka Bar Association is recognized by law as a completely self-governing organization, over which there is no governmental ministry having jurisdiction. Maintaining attorney discipline through the “Discipline Maintenance Committee", “Disciplinary Action Committee", “Dispute Resolution Committee", and other committees. The Osaka Bar Association guides and oversees attorneys with respect to compliance with and violation of the Practicing Attorney Law and/or the Osaka Bar Association rules, misconduct impairing the dignity and integrity of attorneys, and disputes in relation to legal practice. At the same time, each attorney is granted independence with respect to his or her practice from the standpoint of protecting legitimate rights and interests of clients and confidentiality obligations. For the purpose of balancing these interests and also to achieve the goal of ensuring discipline among members based on careful deliberation, the Osaka Bar Association has implemented a Discipline Maintenance Committee, a Disciplinary Action Committee, a Dispute Resolution Committee, and other mechanisms, which include outside experts. The motto of the Osaka Bar Association is "A Bar Association Accessible to Citizens". In order to prevent management of the Osaka Bar Association from lapsing into self-righteousness, and also to reflect a wide range of voices from citizens, the Osaka Bar Association implements Public Meetings. In these meetings, the Osaka Bar Association receives a wide range of candid opinions of members selected from various sectors and levels of society, including consumer groups, mass communication organizations, and universities. ② Implementation of "Public Sessions"
The Osaka Bar Association implements "Public Sessions" which respond to and advise citizens after hearing their demands, complaints, or other concerns regarding an individual attorney's practices (The formal name is "Public Sessions Regarding Attorney Practices"). On June 17, 1880 (the 13th year of the Meiji Era), the "Osaka Union of Advocates" was founded by 58 advocates as a predecessor to the Osaka Bar Association. This was also the period of the rise of the Freedom and Peoples' Rights Movement. In 1889 (the 22nd year of the Meiji Era), the Meiji Constitution was officially announced, and shortly thereafter, when the Practicing Attorney Law was enacted in 1893 (the 26th year of the Meiji Era), the Osaka Bar Association was founded. However, because the attorneys at such time belonged to each individual district court, it was necessary for them to register on attorney lists furnished by the courts. In addition, the bar associations in those days were under the supervision of the chief public prosecutor as in the time of the Osaka Union of Advocates, which meant that there was no autonomy as we have at present. In the era of Taisho Democracy, members of the Osaka Bar Association handled jury trials and addressed the challenges of unity of the legal profession as non-governmental practitioners, and with the spirit of non-governmental practitioners and anti-authoritarian advocates, were actively involved in human rights activities with respect to rice riots, agrarian disputes, governmental human rights violations, and other activities which allowed them to obtain the trust of citizens and seek improvement of their social position. Thereafter, though the Osaka Bar Association faced negative consequences as a result of being part of the wartime regime, after the Second World War, the division of powers was recognized (abolishing the judicial system predominated by administrative authority) under the Constitution of Japan, and the Osaka Bar Association acquired Autonomy of Attorneys by promulgation of the current Practicing Attorney Law, Article 1 of which states that the mission of attorneys is "defending fundamental human rights and realizing social justice". After the war, in the controversy over public safety ordinances under the American occupation, the Red Purge Incident, the Suita Incident, revision of the Police Law and many other cases, the historical role played by the Osaka Bar Association was very significant. Environmental pollution issues in various locations occurred during the era of accelerated economic growth in post-war Japan, and Osaka was the location of many civil rights movements, such as those against noise pollution created by Osaka Airport, air pollution in the Nishi-Yodogawa district, and other incidents. While members of the Osaka Bar Association fought in the courts, they also advocated establishing environmental rights as a "new human right". Afterwards, there occurred a new era of mass production/mass consumption which generated new consumer-related issues, including food poisoning, defective products, and at-home sales. The Osaka Bar Association established a Consumer Protection Committee to address these problems. Later, the Osaka Bar Association played an active role in consumer finance issues, the Toyoda Shoji scheme and other cases, setting the standard for attorneys nationwide. Building on the determined efforts and sterling achievements of our predecessors, the Osaka Bar Association will continue to fulfill the mission entrusted to us by the public of defending human rights and fighting for social justice. We aim to provide high quality legal services to all citizens, and as a bar association, we strive to be as accessible as possible to the public. The Osaka Union of Advocates (58 members), the predecessor of the Osaka Bar Association, was established. Revision of the Rules for Advocates (Establishment of unions and compulsory participation). The Association of Osaka District Court Attorneys was established (100 members). Founding meeting of the Japan Attorney's Association, the predecessor of the Japan Federation of Bar Associations. The first Osaka Bar Association building was completed. Change of name from the Association of Osaka District Court Attorneys to the Osaka Bar Association (during the time of the former Attorney Law). 639 members and 1 associate member (as of April of that year). The Japan Attorney's Association reformed. The Japan Federation of Bar Associations inaugurated. The second Osaka Bar Association building was completed. The Osaka Bar Association marks its 100th anniversary. Establishment of the Legal Counseling Center of Osaka Bar Association. Special legal consultation concerning the Kobe Earthquake. Established the Council for Promotion of Justice System Reform. The current Osaka Bar Association building was completed. Support for recovery efforts related to the Great East Japan Earthquake Disaster. Investigates alleged violations of human rights in order to protect fundamental human rights and also conducts a wide range of activities for defense of human rights. Conducts investigations, research, and provides suggestions in connection with consumer issues in order to protect general consumers. Conducts investigations and research on pollution and environmental problems from the standpoint of defending basic human rights. Promotes improvements in the comprehensiveness and quality of criminal defense in order to defend the human rights of the accused. The Committee also seeks improvements in the handling of criminal cases and reform of the criminal system. Supports victims of crime through legal consultation and other forms of assistance. Addresses children's rights issues in general, conducting investigations and research into actual conditions, and makes relevant proposals. Carries out a wide range of activities with the goal of optimizing and expediting the handling of civil cases involving road traffic accidents. Conducts investigations and research, and provides information on various problems in connection with poverty, such as public assistance, low-wage employment, suicide, child support expenses, student loans, and works extensively with other groups. Supports whistleblowers and informants through legal consultation. Conducts and provides guidance regarding legal education for schools and other institutions, and prepares materials for legal education, such as model lectures, scenarios and DVDs for mock trials and simulations. Conducts investigations and research, provides proposals regarding international legal issues, supports members engaged in activities for legal technical assistance overseas, and spearheads friendship and communication initiatives with foreign legal organizations. Provides support and guidance for people who have suffered damages due to the involvement of criminal groups, and aims to eliminate improper interference into the practice of law. Carries out investigations and research into administrative disputes, disclosures of information, and related issues in order to determine the scope of appropriate activities of government offices. Provides legal advice and seminars, and investigates legal reforms, regarding intellectual property, such as patent, trademark and unfair competition issues. Conducts investigations and research on labor and employment issues and related activities, and provides consultation and cooperation with related agencies to solve labor and employment issues from both labor and management perspectives. Proposes and executes plans to solve various issues related to medical care through cooperation of attorneys representing both patients and medical institutions. Conducts activities for promoting gender equality in the Osaka Bar Association and makes results of such activities public. There are various committees established to actively do their tasks. In order to respond to citizens' legal service expectations and requirements, we offer consultations concerning all aspects of legal affairs, including general law, juvenile law, criminal law, consumer damages, consumer finance damages, housing and construction claims, medical malpractice, intellectual property, legal concerns of foreigners, social welfare, and other areas. We also introduce attorneys upon request (This service is provided though the Osaka Bar Association building only). 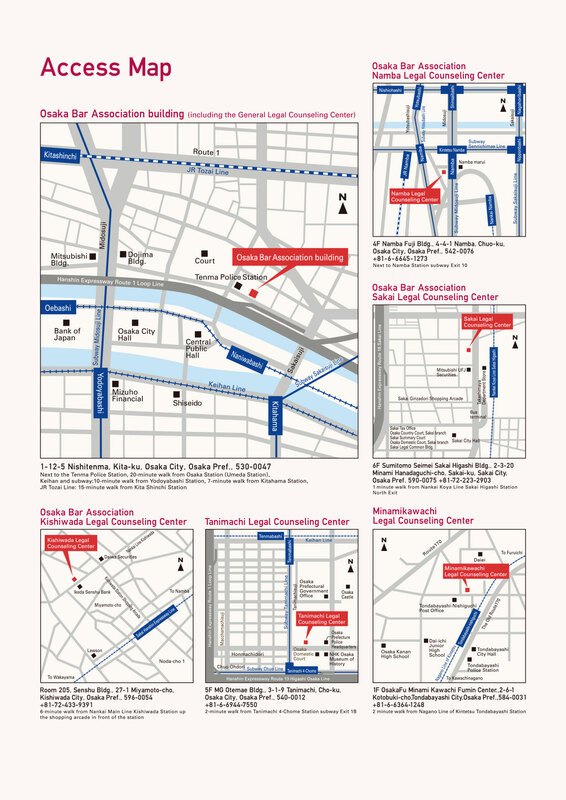 These consultations are available at the Osaka Bar Association building and Legal Counseling Centers in Namba, Tanimachi, Sakai, and Kishiwada. 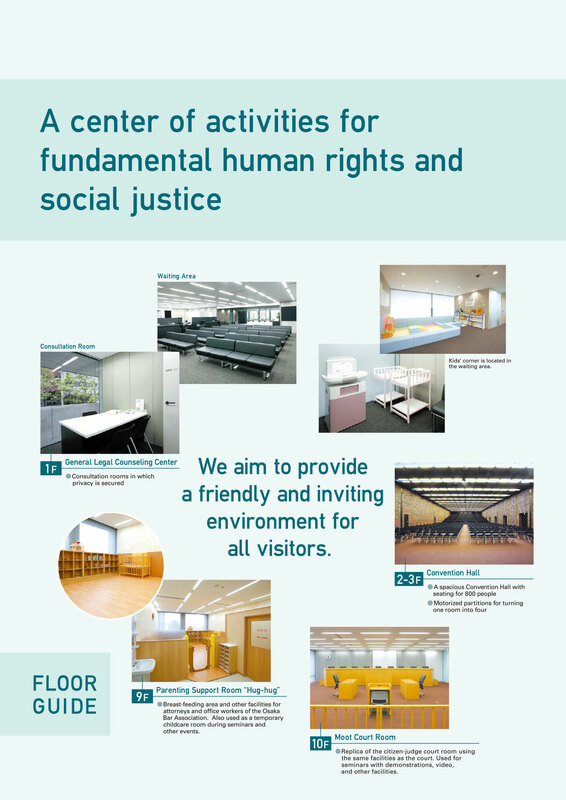 "Himawari" is a general legal support center for elderly and handicapped persons. We offer visits for consultation for those who are unable to visit the Bar Association due to advanced age or physical and/or mental handicaps. After consultation, we also provide asset management services and conduct negotiations with care and welfare facilities. Proper legal knowledge is indispensable for making a will and preventing disputes regarding inheritance. If you have any troubles or concerns relating to these issues, please call this center for a telephone consultation free of charge. The Osaka Bar Association launched this center, as an unprecedented experiment in Japan, to support public administrative agencies for better local governance and civil welfare through partnership with such public administrative agencies. We provide highly specialized human resources and legal services matching to the needs of local government. We offer legal services for issues surrounding small and medium-sized enterprises, including debt collection, labor and employment issues, disputes with business partners, customer claim management, and business succession. We provide legal consultation for business managers and persons in charge of commercial enterprises. The Center provides settlement facilitation, mediation and arbitration conducted by lawyers and qualified architects regarding disputes between an owner and a contractor, and/or between a seller and a buyer, regarding housing for which a housing performance evaluation report has been issued based on the Housing Quality Assurance Act, as well as insured housing, which is covered by housing defect liability insurance based on the Act for Secure Execution of Defect Warranty Liability. The system operates from 9am to 5pm, Monday through Friday. For weekends or national holidays, you may leave a message on the answering machine and we will soon reach you back for your assistance. ☆Please keep in mind that a duty attorney cannot go to Immigration-Control Center to assist persons detained for the violation of Immigration-Control and Refugee-Recognition Act. ☆For your best interest, we recommend you to have someone fluent in Japanese to call the Hotline for you, as the operators are not conversant in English. This organization provides simple, quick, and fair dispute resolution services for a variety of issues involving all kinds of compensation disputes, neighborhood disputes, domestic disputes, and other disputes. Neutral facilitators with expertise carefully hear the case from both sides and lead the parties to an agreeable resolution. This Center is a legal entity established under the Comprehensive Legal Support Act within the framework of an independent administrative agency. As an easy-access and friendly consultation liaison, the Center provides legal services to the general public by operating a civil legal aid program.